We are thrilled to inform you that your business has been named a Fodor Choice 2010 establishment by the leading publisher of guidebooks for American travelers! For over 70 years, Fodor’s has been publishing a range of premium travel guides for travelers to domestic and international destinations. Each year our expert team of writers around the world selects an exclusive list of restaurants, hotels, and attractions in their area to represent the best places to visit when traveling to the region. Your business has been chosen as one of these top establishments and is being noted with the Fodor’s Choice distinction in our guidebooks. lt is also recognized with special placement on Fodors.com, where 1.5 million unique users access travel information each month. For 2010, we are introducing an updated look for Fodor’s Choice. Enclosed please find a Fodor’s Choice decal (featuring the revised logo) that can be displayed on the window of your place of business to tout the award of distinction you have received. 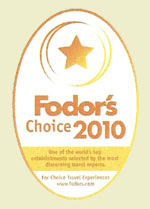 lf you would like to promote your Fodor’s Choice award on your website, please visit www.fodors.com/fodors-choice/. You’ll find an on-line version of Fodor’s Choice decal to post on your site as well as a downloadable press release template. You can also request additional decals and learn more about Fodor’s Choice.